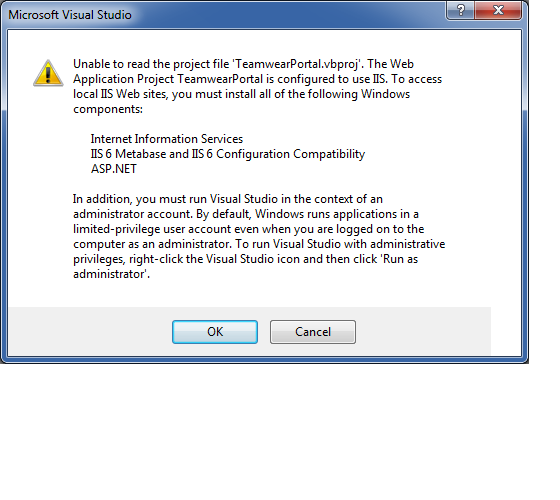 Unable to read the project file 'xyz.vbproj'. 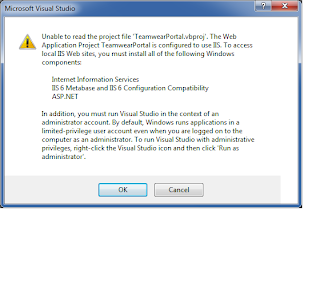 The Web Application Project xyzApp is configured to use IIS. To access local IIS Web sites, you must install all of the following Windows components: Internet Information Services IIS 6 Metabase and IIS 6 Configuration Compatibility ASP.NET In addition, you must run Visual Studio in the context of an administrator account. By default, Windows runs applications in a limited-privilege user account even when you are logged on to the computer as an administrator. To run Visual Studio with administrative privileges, right-click the Visual Studio icon and then click 'Run as administrator'. Success, the project loads and everything is running.